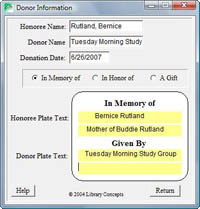 The BASIC program includes the collection management activities required in any growing library. All other PC Card Catalog program modules require either BASIC or CIRCULATION as a foundation. 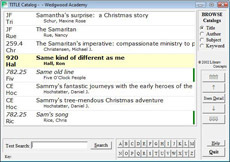 Catalog lookup (by Author, Title, Subject and Keyword) is intiutive as a traditional card catalog yet with the power of the computer. Catalog filing is in AACR2 (typical library) order, not computer ASCII order as with other programs. Item entry and update is fast and efficient with Subject, Author and Publisher authorities a click away. Import MARC from vendors (microlif or MARC 21) or web sources such as the US Library of Congress. Import text (ASCII) from other sources such as Excel or Access. Entry options include Added Entries, Series, Bound-with's and Cross References. Catalogs distinguish these with color and font variations. Print Spine/Pocket Labels, Catalog Cards and donation Bookplates. Print lists in any conceivable order. Limit lists by defining ranges and "filtering" on data fields. Now create and print your own Custom Reports with user-selected fields and adjustable formatting. Display onscreen, print or export as Text, XML, Excel or TAB-delimited files. The "Recover" utility is included at no extra cost with new, update and upgrade purchases. See feature description on the Add-On's page. Track donations and print donation bookplates. 90 days Support included: unlimited phone support; priority e-mail; program updates and revisions mailed on CD direct to your library. Annual support after the initial 90 days is a modest $65/year. Add bar code labels to Items. Scan the bar code to recall an Item for editing or Inventory tracking. Requires Internet access and a current Support subscription. 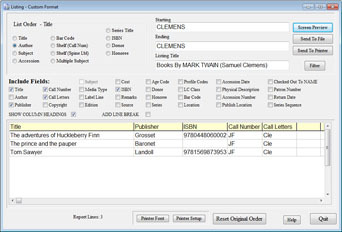 Entering multiple copies of a title is simplified by using the Recall Item feature. This is further enhanced by the use of the Recall Previously Saved Item. 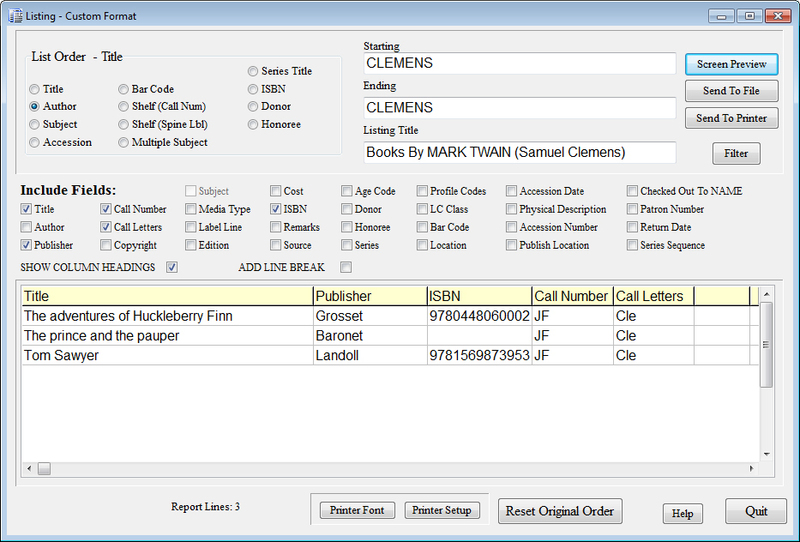 New Title Check feature can recall information from complete or partial Title text. Enter as many Subject Headings as you need. Multiple Authors, Alternate Titles, Analytics, Series and Cross References give your patrons many paths to find what they need. 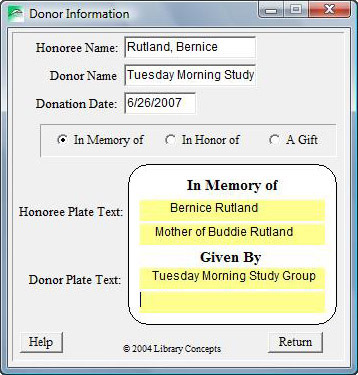 Many libraries will find the Donation tracking feature useful. Other standard bibliographic information is maintained. User-defined fields such as Age Code and Profiles can be used to create specific listings. "Help" information is immediately available on-screen using the [F1] key and context-sensitive buttons. Print Spine & Pocket (or Circulation) Labels on your laser or ink jet printer. Print or reprint in batches from new or existing items. Uses standard label stock available from any library supply store. Define fonts for an attractive, consistent labeling. PCCC can reuse partial sheets of labels. New format includes a Spine Label text "image" on the left. Assign user-defined field names. 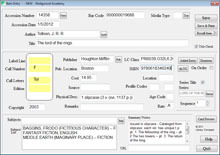 Configure the Spine Label layout specifically to your library's needs. 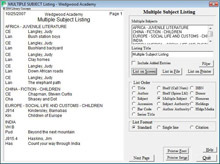 Print Catalog Cards in sets including the Author, Title, Subject and Shelf cards. The card sets are printed in filing order. Uses card stock available from any library supply store. 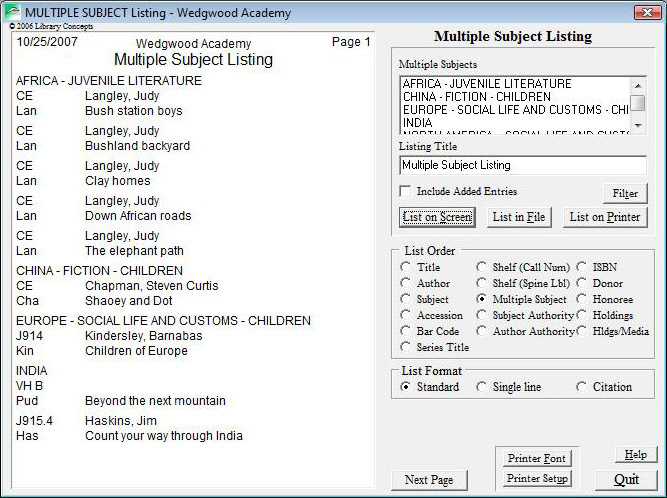 Listings can be made in any imaginable order: Title, Author, Subject, Shelf, Accession, Bar Code, ISBN, Multiple Subject (a very powerful listing feature), Donor, Honoree, Author & Subject Authorities. The Listing can be viewed on-screen, saved as a file or printed on the printer. 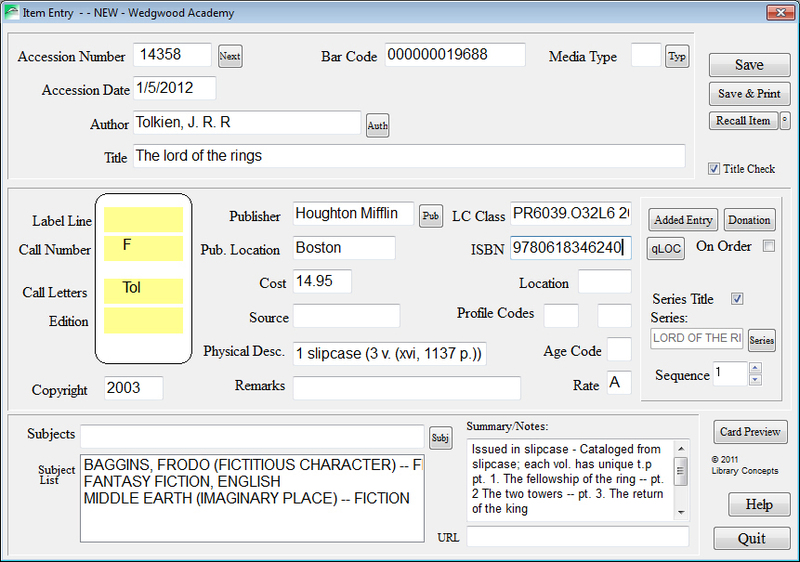 A new "filtering" feature allows the librarian to further define the list by media, dates, Age and Profile codes, location and other criteria. Holdings Report gives an immediate "snapshot" of your library's value and category distribution. NEW Shelf List uses Spine Label order, adapting to any user-configured Spine Label formatting. Newly Added: A CUSTOM REPORTS feature has been added to provide a completely user-defined report listing. Display only the needed fields; arrange the formatting; edit onscreen. Use the "filter" option to further refine the report results. Print the reports or export them in several useful formats: Text, Excel, TAB-delimited and XML. Unique reports are easy to create and modify. * It's so efficient we have completed a 10,000 item library Inventory in just one day! The Shelf list adheres to new standards that define Series as shelved in sequence order instead of the older alphabetic standard. Unlike other library systems, PC Card Catalog adheres to precise "AACR2" alphabetizing for its Listings and its Catalogs. 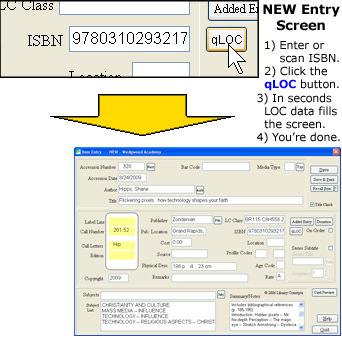 The HomeWork utility (an optional program) allows the "Item Entry" program segment to be installed on other computers. Volunteers or staffers using their home or office computers can now add data by "merging" their entries with the "master" collection. A great way for libraries to switch quickly to automation. Other features include a built-in Backup procedure, extensive context-sensitive HELP, a printed manual, and support. The Keyword Catalog can be defined to automatically use keywords from the Title, Subjects, Notes, Donations or any combination of the four. BASIC licensing can be obtained for a single computer or for a limited (3-user) network. Larger networks are served with the unlimited CIRCULATION license. All versions can be used with the network-capable PUBLIC ACCESS program. Bookplates can be printed from Donation information for an attractive recognition of gifts. Uses widely available label stock. More features than we can describe here... Download free DEMO and discover how PC Card Catalog can work for you.